Yearbook celebrates the end of school by looking back over all the important milestones throughout the year. 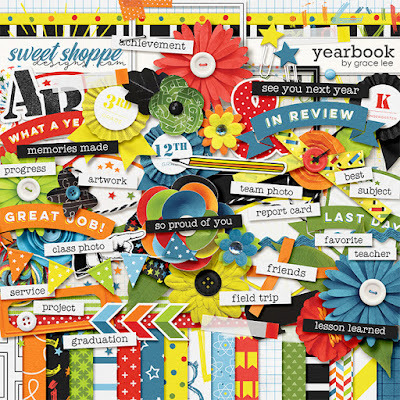 Put together great last day of school photos or create highlights or year-in-review layouts with this colorful, smart kit that will send you straight to the head of the class! and 114 elements. The elements included are: 1 ampersand, 3 arrows, 5 badges, 1 banner, 1 book plate, 5 bows, 3 buttons, 4 clips, 1 finger, 12 flowers, 3 foliage, 4 frames, 14 labels, 3 paint, 1 pencil, 3 pins, 3 ribbons, 1 ric ran, 6 rosettes, 1 scatter, 1 staple, 1 string, 5 tabs, 3 tape, 5 titles, 23 word art, and 1 yoyo.